Sydney is the most populated city in Australia, home to the world famous Sydney Harbour, Opera House and Harbour Bridge! Since our travels, Sydney is the second most expensive city we have been to (NYC being #1). We stayed only a few days and packed a lot in the short time we were there. We rented an in-law unit from AirBnB in the Marrickville area. It was a great location as it was only a 10-minute walk to the nearest subway station. The subway ride into the city was only 35 minutes. 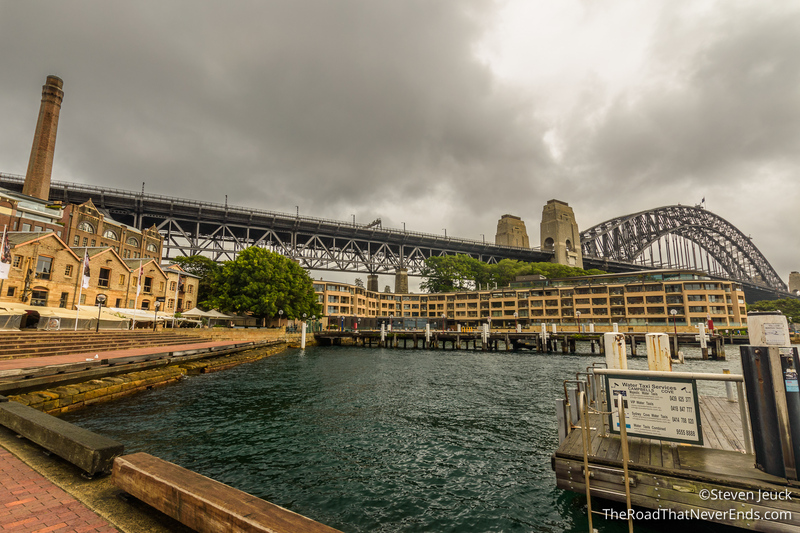 We had trouble finding a cheap place to stay in Sydney. 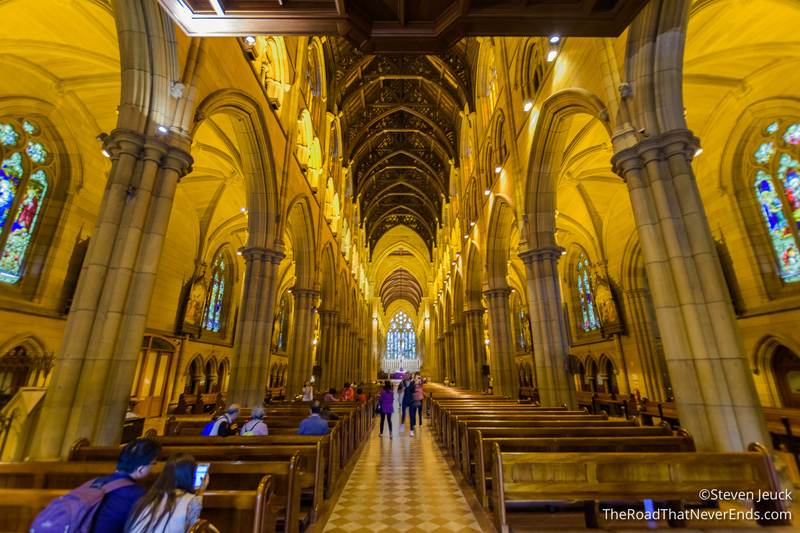 We learned quickly that Sydney is an expensive city – lodging, food, drinks, etc. We felt our AirBnB was a great find, but still slightly out of our budgeted price range for Australia lodging. Once we dropped the car off at the airport, we bought ourselves an Opal card (similar to Clipper card in the Bay Area) and took the subway to our stop, with only one transfer. What we didn’t know was that if your journey includes the airport station, it adds on an Airport Link price – somewhere around $15 AUD ($12USD)! The ride from the airport to our place cost us $36 AUD ($27 USD) total! We decided that on our way out of Sydney, it was better for us to get an Uber – we ended up being right, it costing us $20 AUD ($15 USD). Around the city, travel via the Subway was easy and cheap. We are becoming pretty good at public transportation now that we have used it in a few countries. We also utilize Google and the Transit app which helps a lot (but unfortunately doesn’t work in all markets). 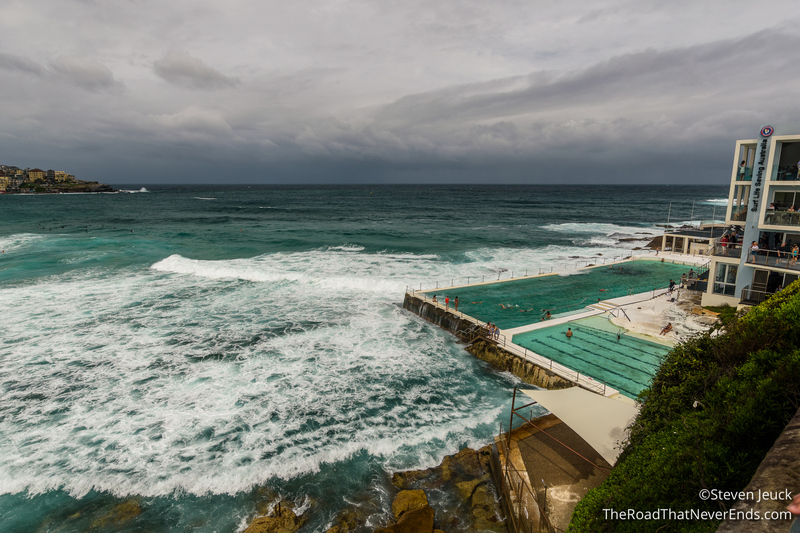 In addition to the subway, we took the bus to Bondi Beach, and from there to Watson Bay. We learned that the bus doesn’t stop automatically at every stop (even if there are people sitting at the stop waiting), instead you have to hail them. Yes, we waited for 20 minutes for our bus and when we stepped to the curb we were surprised it just drove right by us. We decided the next bus I would wave frantically and if needed step in front of the bus (not really). But the waving worked. Like the subways, the busses were clean and air-conditioned. The bus drivers leave a little to be desired when it comes to friendliness and smooth driving. The last mode of transportation we took was the ferry. 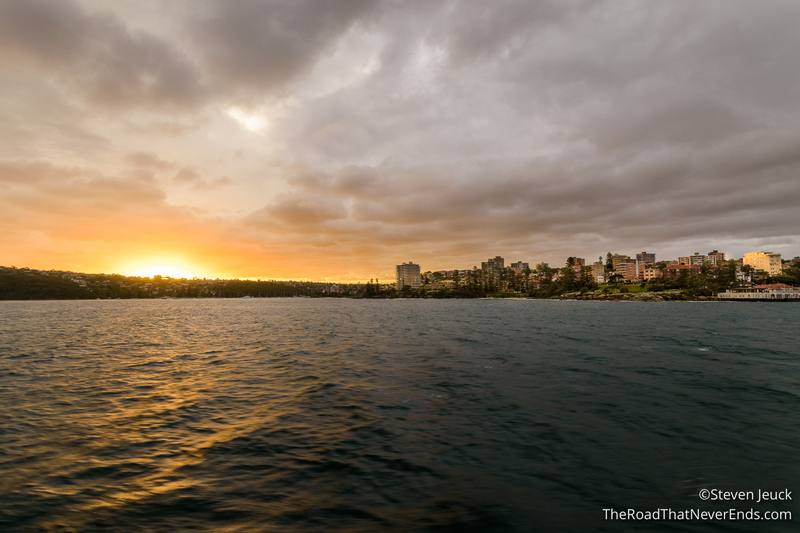 We took a paid private ferry from Watson Bay to Manly Wharf, and the public ferry from Manly Wharf to Quay Wharf. The paid ferry was called “Captain Cook” and the ride to Manly, we were given a lecture all about the history of the harbor. The public ferry was quite nice too, although much smaller and slower. The boat can fit about 1,000 people. We rode it around sunset, and was treated to some spectacular views. 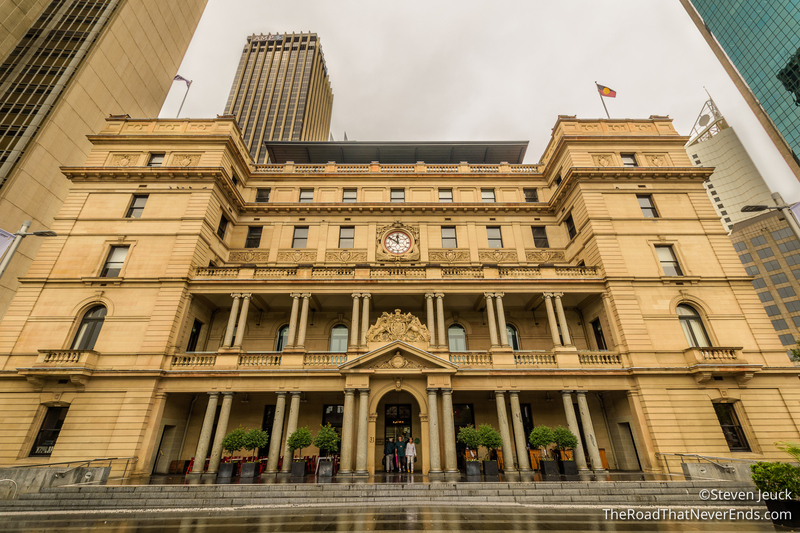 Customs House – Conveniently located outside the Circular Quay Subway station, this beautiful building once served as the customs house for all ships entering the harbor. 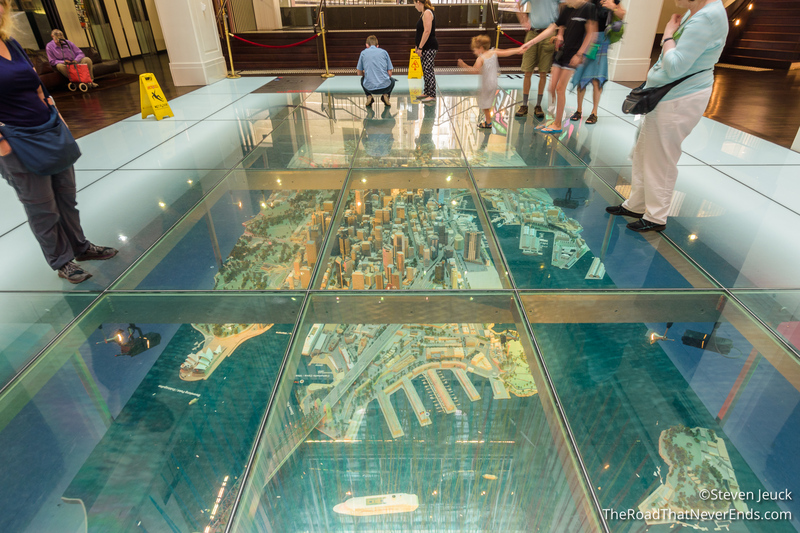 We walked inside and saw a glass floor with a scale model of the Sydney below us. You can “walk across Sydney” in a matter of seconds. 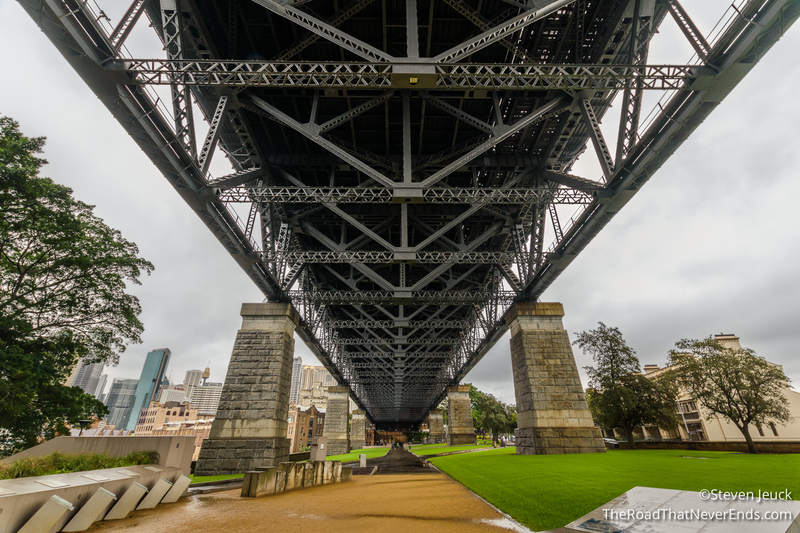 Dawes Point Park – This park is located beneath Harbour Bridge. It pays tribute to the original Dawes Point Battery, built in 1791, and later demolished to make room for the bridge in 1925. 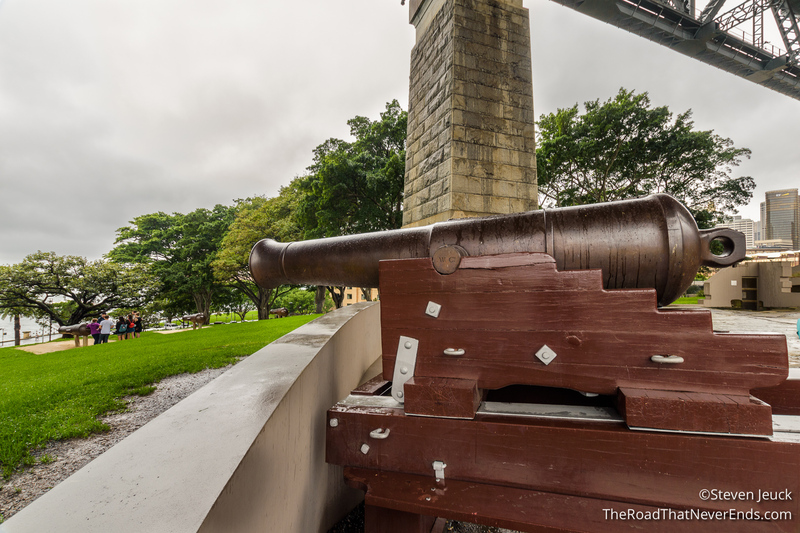 Today you can walk around the park, check out the old cannons, and read the exhibit panels about the battery. Still in the ground are the foundations of some of the old buildings that were torn down. Steve is a big war buff, and we found this park fascinating. I am not sure many people visit the park, but we are sure glad we did. 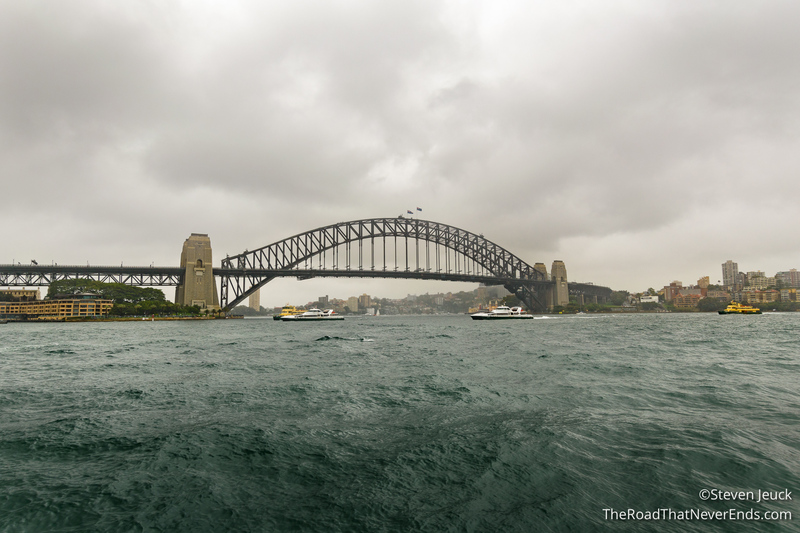 Sydney Harbour Bridge – We walked across the bridge (in the rain) and walked back. There is a tour group that allows you to climb the bridge for a fee. 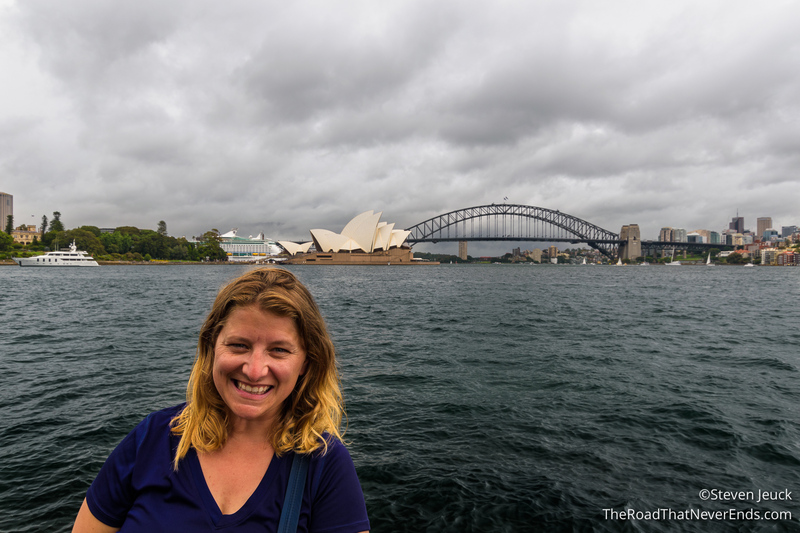 Seeing that Sydney was already expensive, the weather being crappy – we skipped that, we walked for free instead. Sadly, our photos don’t show how truly beautiful Sydney’s harbor is. 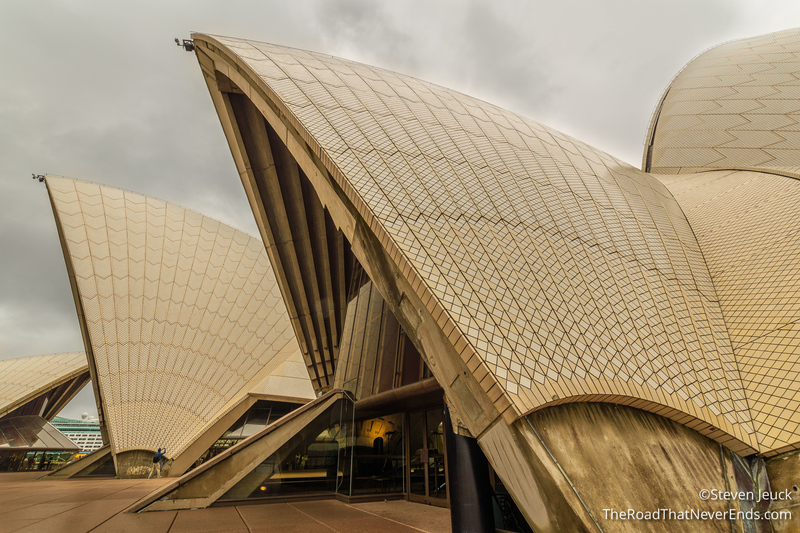 Sydney Opera House – I remember watching the 2000 Olympics and constantly seeing this beautiful building. Seeing it in person, it is just as stunning. 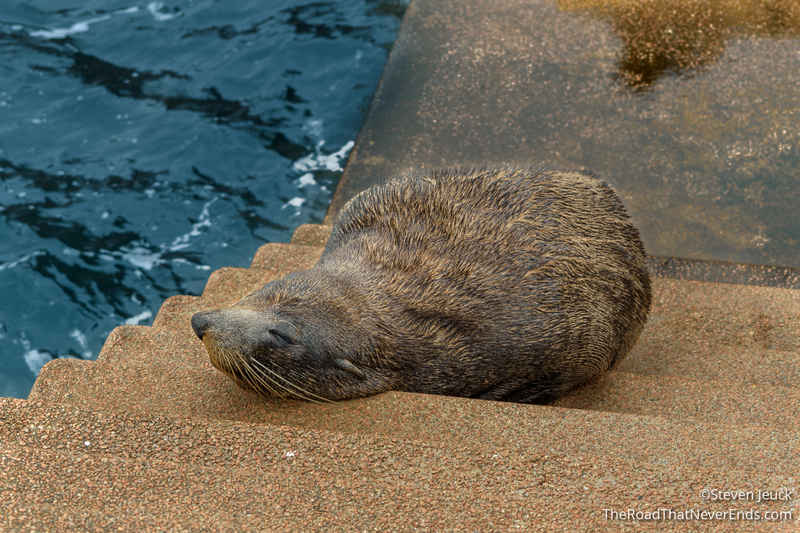 We walked around, and got great views of the Harbour Bridge, as well as getting up close and personal with a seal sleeping on the steps. 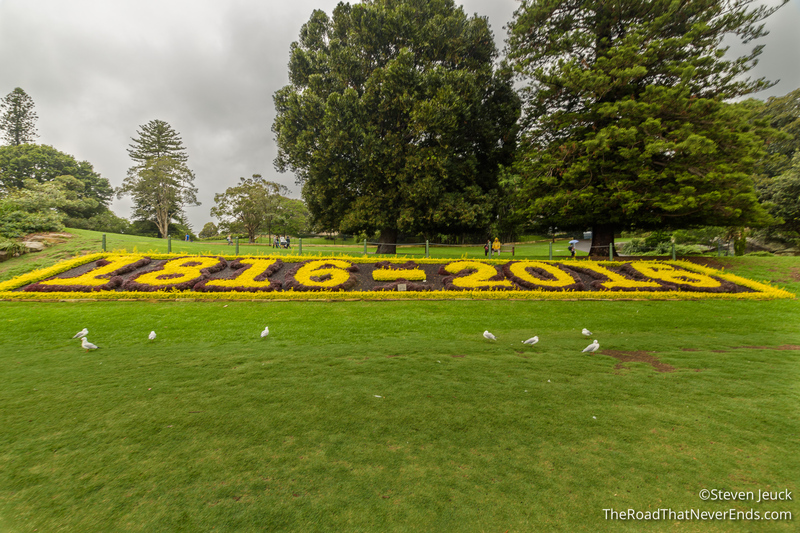 Royal Botanic Gardens – We are really enjoying Australian’s botanical gardens. So far, Melbourne and Sydney has treated us to such natural beauty. 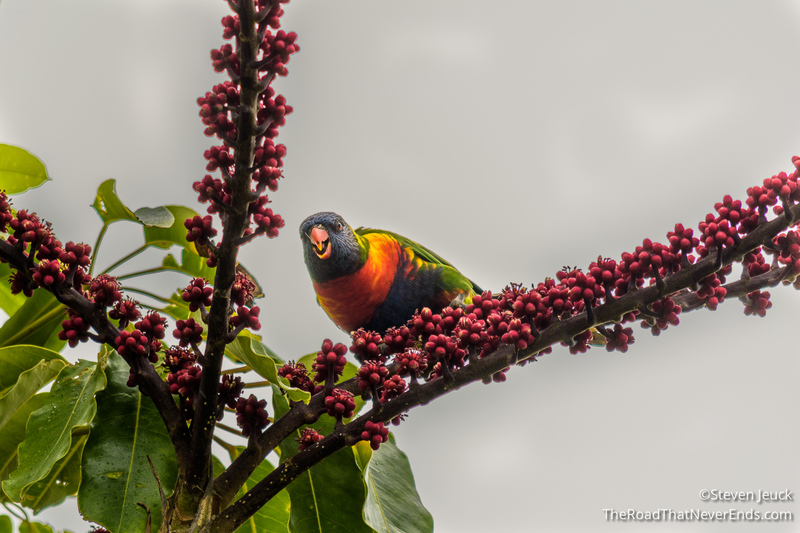 Here in Sydney, we were excited to see Rainbow Lorikeets! In fact, there were several beautiful birds as well as trees! 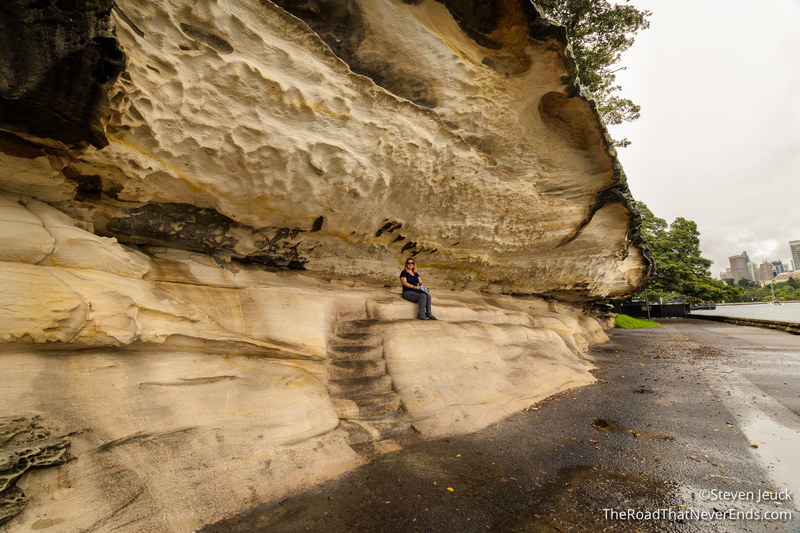 Mrs. Macquaries’s Chair – This sandstone rock was carved and formed into a bench in 1810 for the Governor’s wife, Elizabeth Macquarie to sit and enjoy the view. The entire area has fantastic views of the harbor. 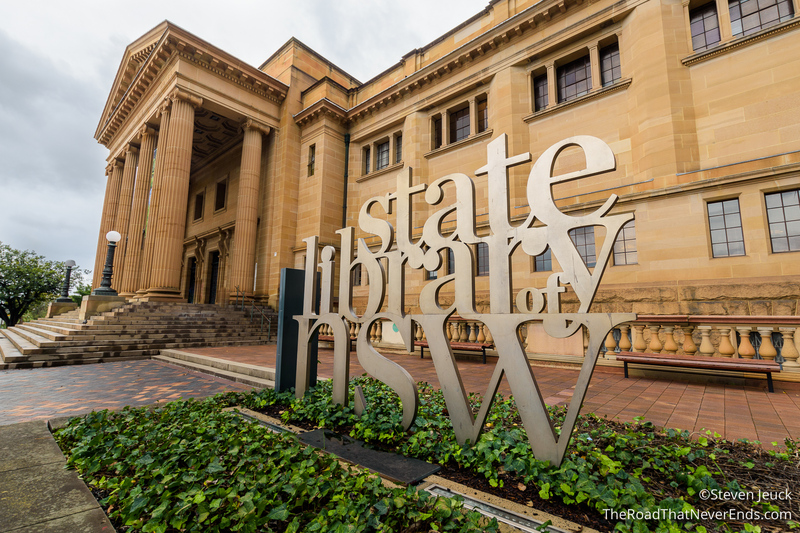 The New South Wales State Library – The library has amazing exhibits and is impressive. In fact, it is the oldest Library in Australia! 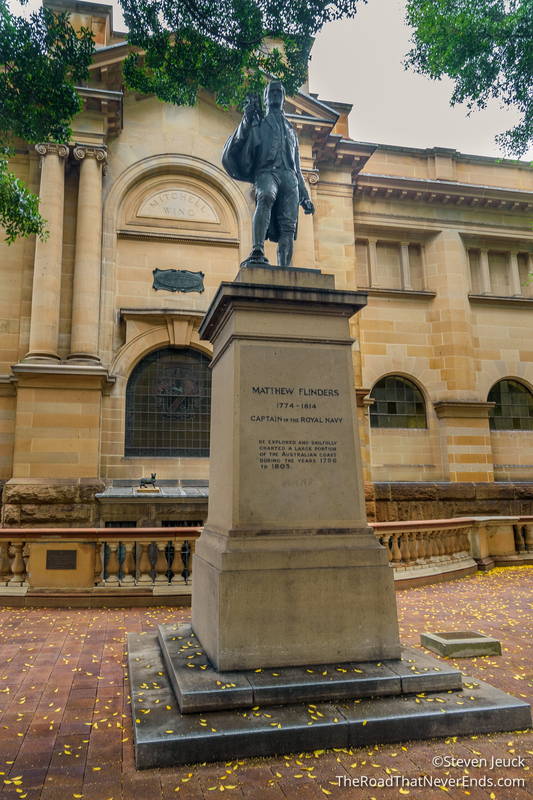 What caught our attention almost immediately while walking around it was a statue of Matthew Flinders. What is even more peculiar, was a statue of his cat “Trim”, whom he loved. Trim accompanied him on his voyage to circumnavigate Australia. While returning to England, Flinders was accused of spying by the French and imprisoned. Trim was also imprisoned with him until his “mysterious disappearance”. Flinders was quite upset by this. Steve and I always appreciate that kind of dedication to your pet. Hyde Park Barracks – We were disappointed to have arrived right when the museum was closing, but were still able to check it out. 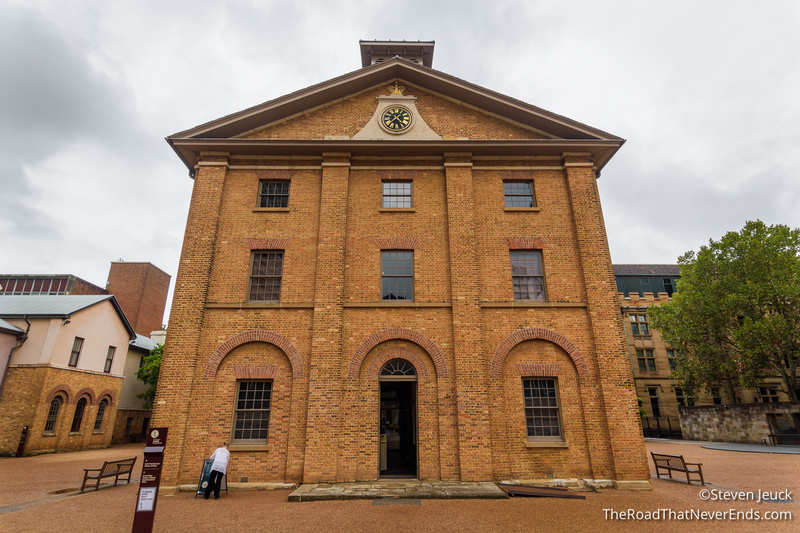 Built in 1818 to house convicts, the building still stands today! 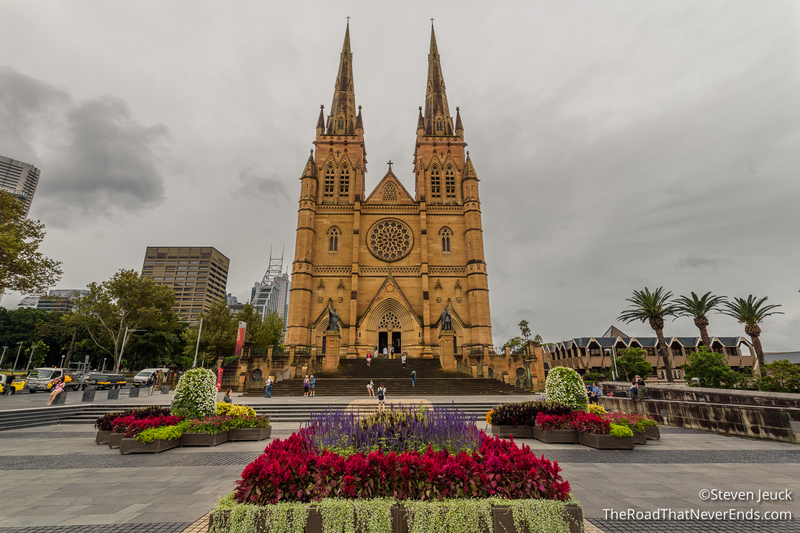 St. Mary’s Cathedral – Beautiful gothic style church with a crypt! 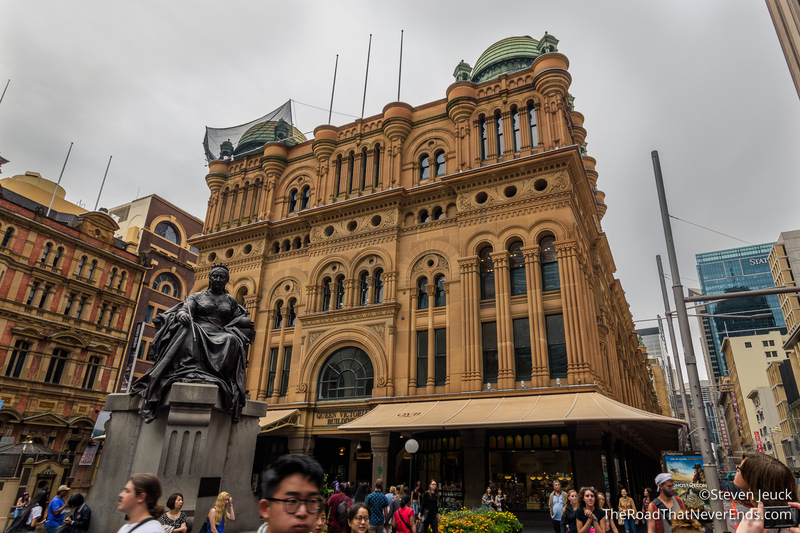 Queen Victoria Building – Gorgeous building built in 1898, is a place to shop, eat and get High Tea! 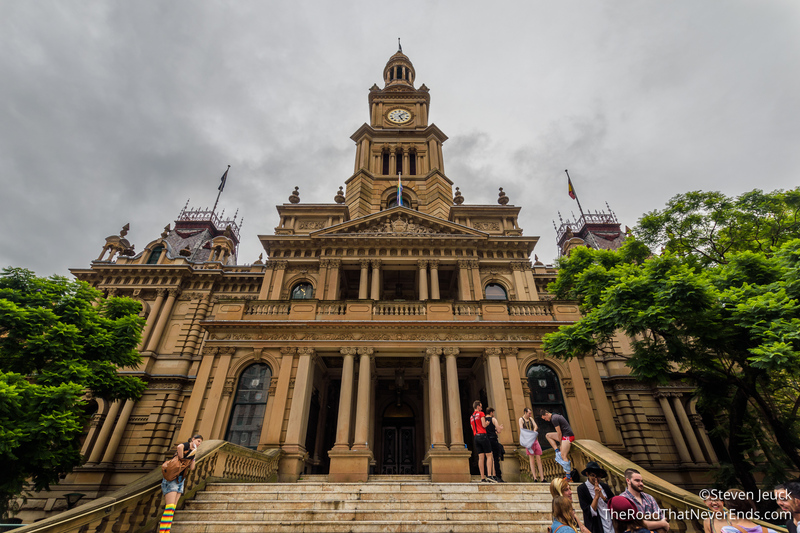 Sydney Town Hall – Fantastic place to stop and admire architecture. The building was built on top of an old cemetery (creepy) and made from local sandstone! 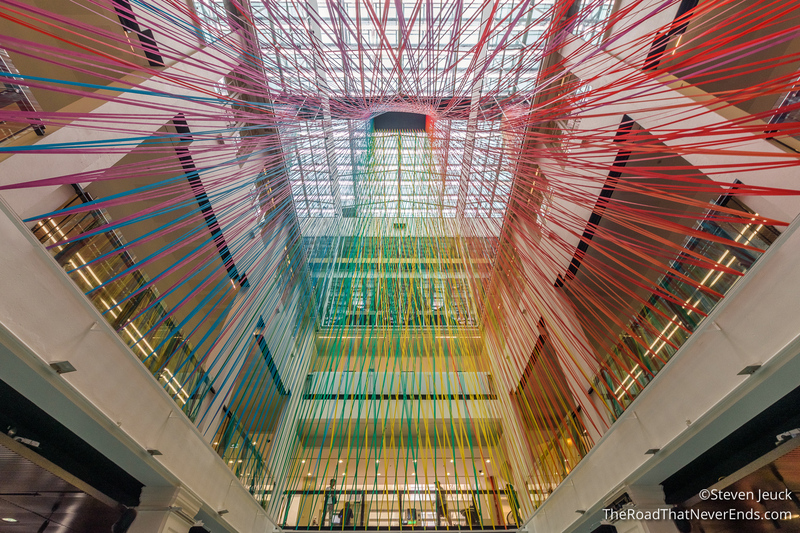 The building plays hosts to concerts, and other important meetings, and many locals claim it is haunted! 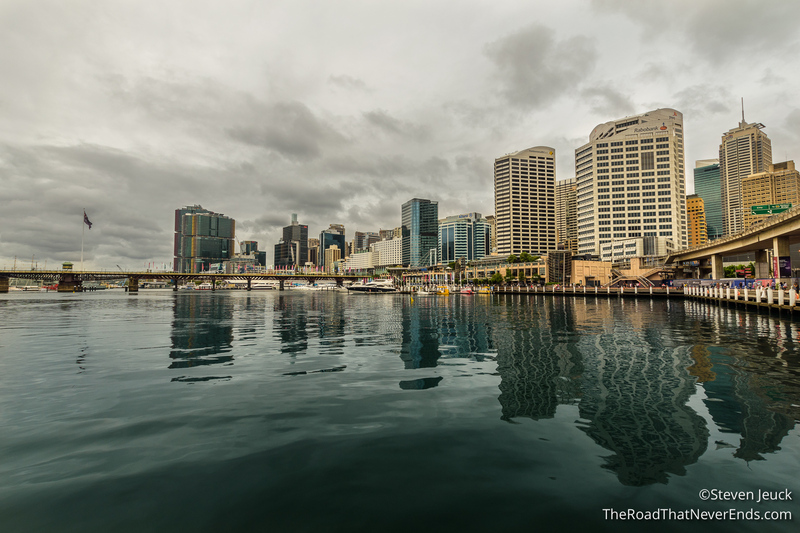 Darling Harbour – We enjoyed walking around this very trendy area, there is lots of shops, and a huge outdoor playground. We didn’t go to the Aquarium, but that can also be found here too. 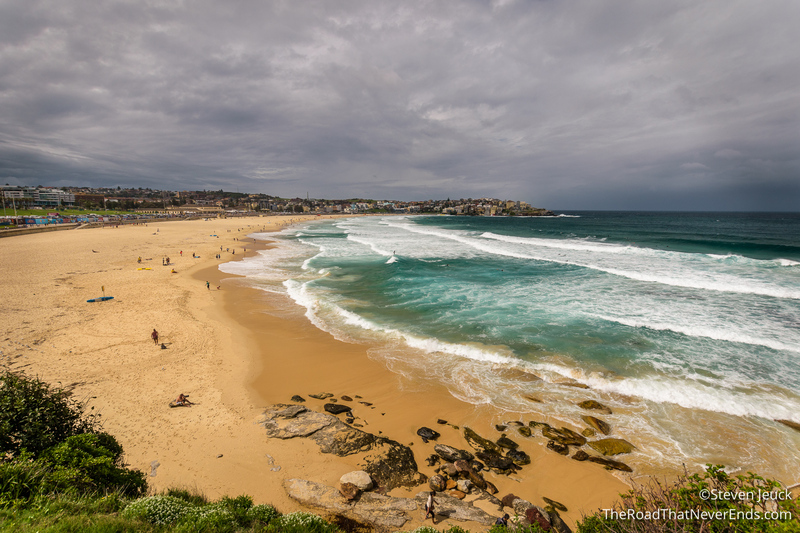 Bondi Beach – This beach was a lot of fun (did I mention we saw the sun here for 5 minutes). We walked around the shops, had lunch, and spent time watching the surfers. 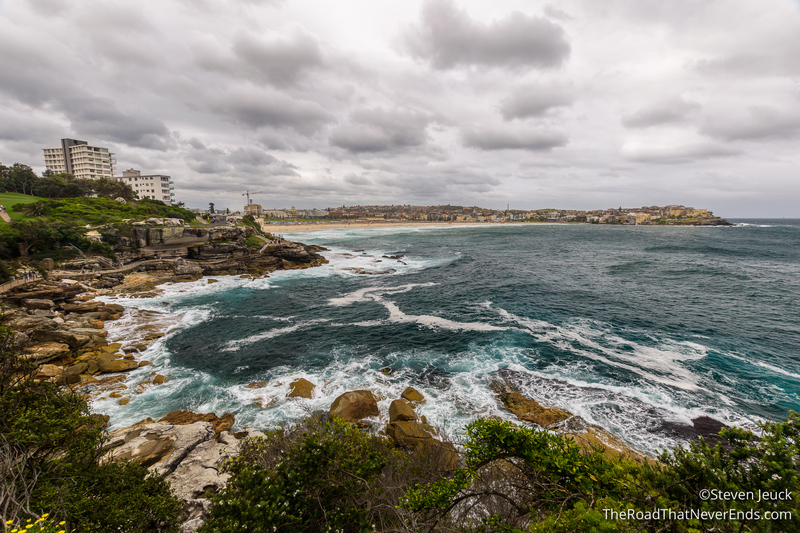 We also started the walk to Coogee Beach and the views of cliffs and rocks were picturesque. About halfway the rain got heavy, and we decided to stop the walk and take a bus to Watson Bay wharf. Manly Beach – Manly beach felt a lot more expensive and ritzy than Bondi. 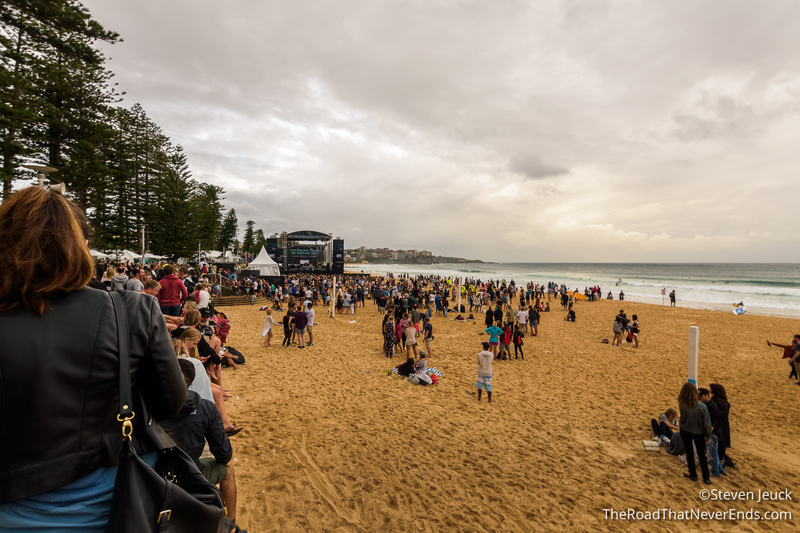 While visiting, a surf competition had just ended and the after party celebration was starting. This included a free concert on the beach. Steve and I walked around and enjoyed the festivities for a short time before heading back on the ferry. We felt a bit out of place in the glitz and glamour of Manly.